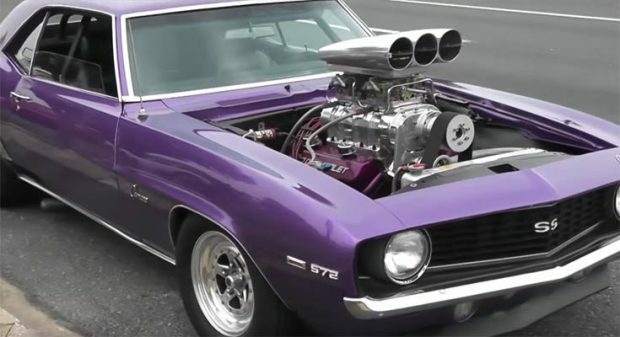 This customised 1969 Camaro SS featuring a supercharged 572ci engine is a sight to behold, especially with that huge supercharger and colour-coded engine block to match the rest of the vehicle. You don’t get a load of detail with this car apart from the engine size, but once you watch the video you appreciate this classic Camaro muscle machine for all its worth. 40 years on these vehicles are still revered for their basic design and as you can see in this example the lengths of customisation that can be done with each build. Check out the video to see this Camaro in all its glory. ← Previous Story Is The Ford Mustang Shelby GT350R The Best Sounding Modern Muscle Machine?